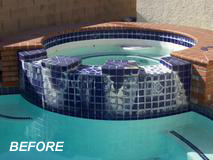 Clean pools drastically changes the appeal of a pool. 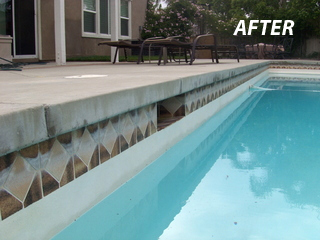 Calcium deposit over time leaves a faded and cloudy look which happens often in Arizona due to the heat and chemical intake of the pools. If you attempt to remove the calcium deposits, it takes a lot of scrubbing and the store is likely to sell you products that require a lot of elbow grease. 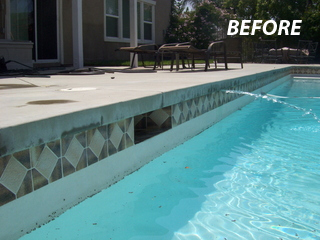 The best way to restore your pools fresh appearance is to clean it. We can clean most types and base our pricing a set amount per linear foot depending on what you have. To ensure your pool perimeter is in the best condition, we have special tools to use on your that will remove the scum but keep your surface intact. 1. We reduce your water level below the line to allow for cleaning. 2. Depending on the extent of the build up, we ether glass bead blast or soda blast at a low psi. We will do this for the entire length of your pool. 3. Using our pump and filter, we clean the cleaning particles from the pool cleaning the area. 4. 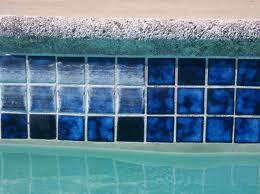 Your tile will be refreshed and we will finish cleaning your pool, leaving it looking great and shining. Often, cleaners will operate at 50psi which is way too high, in Perth the whole cleaning concept is different and much more efficient, same principles as carpet cleaning applied to pools to maintain the well being of the tiles. 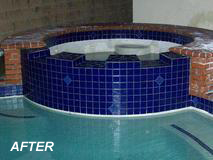 We make sure to do a great job and leave your pool looking great.